Spin all about ancient Egypt and unlock a mystical Bonus Round certain to win you loads of riches with Pharaoh's Luck slots! 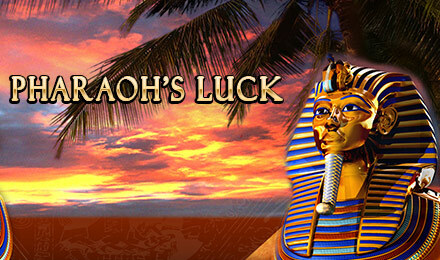 It will be smooth sailing down the Nile when you start spinning to win big with Pharaoh's Luck slots! With the option to change the amount of paylines as you change your bet, you'll be the one in control when you play this exotic slots game. Wilds, Scatter symbols, and awesome bonus rounds will have you building pyramids of wealth and challenging the Pharaoh himself!